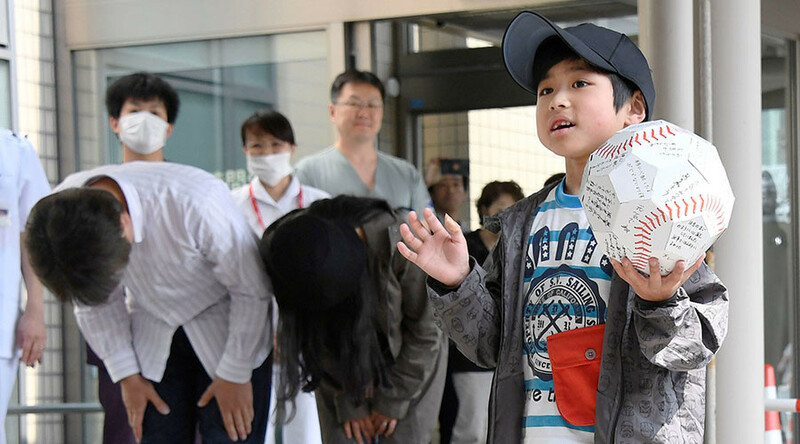 The young boy abandoned by his parents in a Japanese forest has been discharged from hospital and has said that he couldn’t stop crying after he was left alone. As Yamato Tanooka left hospital on Tuesday, he waved to a crowd of wellwishers gathered outside and spoke briefly about his traumatic ordeal that entranced people around the world. “I’m alright,” was the seven-year-old’s response when asked how he was feeling - which is certainly not how he felt after realizing he had been abandoned by his parents for what they said was punishment for throwing stones at cars. It’s understood the boy intended to follow his parents’ car after they drove away from him, but he was so upset and couldn’t stop crying that he ended up walking in the wrong direction, reported Reuters. "I walked for about five hours, I think," Yamato told Mainichi Shimbun newspaper on Monday. @RT_com What will be the long term effects on this child? Tanooka said he found the woods “scary” so just kept walking until he stumbled on a former Japanese air force base in the town of Shikabe on the northern island of Hokkaido. "I was cold so I went inside to sleep,” the child said. He stayed at the hut for the next six days with no food and with his only access to water coming from an outdoor tap. The almost week-long search operation involved more than 700 people and Tanooka said he heard the search helicopters overhead, but figured he would be safer staying inside the building until he was found. While the child’s parents may be feeling guilty for their actions, it seems their son isn’t holding a grudge against them for it. The child’s father, Takayuki, told TBS in an interview: "I said to him, 'Dad made you go through such a hard time. I am sorry'." "And then, my son said, 'You are a good dad. I forgive you',” he explained. @amas32@japan_raghu@PriyaRaju@skpkaruna@RagavanG@indiavaasan in USA, the child would be taken away from these parents. Hope no trauma. @RT_com OMG....Heartless people. They should go to jail to learn a lesson how to raise a child. Although the parents’ decision to leave the child on the side of the road sparked anger and debate, police have confirmed that the couple will not face any charges. "We plan not to regard it as a criminal case," a Hokkaido police spokesman told AFP, although the case will be referred to social services. For leaving ur child on the side of the road for 6 days? @guardianworld not even a charge of child neglect NGO,s should make noise or maybe Japan should wait until crimes against kids becomes bad.